BarnDoor Lighting Outfitters has a great selection of chroma key green screen and blue screen supplies for all your video production needs. From chroma key green paint that turns any flat surface into a green screen to full green screen suite that help you create professional-level special effects, these chroma key supplies are excellent to have on hand anyplace you’re using a green screen. 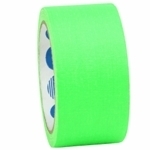 We have chroma key tape, reversible blue screen/chroma key kits and the best chroma key paint at BarnDoor Lighting. There�s a chroma key solution for every space, budget and need in this selection. Use one of our collapsible green screens if you need quick setup and tear-down or buy bulk green screen paint to create your own green screen backdrop. Wescott makes digital chroma key backgrounds that are specifically designed to interface with PC editing with precise color-matching for use with certain programs. BarnDoor Lighting has a team of video production experts on staff to assist you with your questions by phone at 1-888-276-3667 or by e-mail at info@barndoorlighting.com.